I want to get one of these as where I put my blind on the new lease , well kinda got it in the wrong spots with wind and deer traffic . But before moving the stand I wanted to try a ozone machine . Was ready to pull the trigger on the ozonics brand and came across the Scent loc version 400 vs the 300 if thoses specs really mean anything .. This unit is radial as well . cost was 249 its compact and I have been testing the battery life in my office ha ha . from full power to dead 8 hours 21 minutes on normal mode . To me there is very little sound at all on boost mode its a tad louder but not enough to make me think anything will hear it from 2 feet away . Last edited by HDWRENCH; 10-08-2018 at 09:23 AM. Quick google check looks like it is for de-scenting clothes and gear more than stand hunting. All I saw reference to anyways. Will check it out and read more. it used just like the others , wording is due to law suites , they cannot say field generator or deer blind etc . Last edited by HDWRENCH; 10-09-2018 at 08:15 AM. Thank you for contacting ScentLok! There are two output modes on the OZ Radial 400B. On regular mode, it emits approximately 200 milligrams of ozone per hour, and on boost mode it emits approximately 400 milligrams of ozone per hour. I don't have specs of other ozone generators out there, so I'm not sure of the output on other units. Last edited by BTLowry; 10-09-2018 at 08:51 PM. I planned on taking a short video of it fir sound but it’s been raing the entire hunt. So with a breeze I am ok. If no air movement in the blind with window open myself do not like the odor I did receive a few PMs on this. What I gathered is they all are un pleasant in confined space. Hunted with one this past week and will say sitting inside a tight 6x6 blind, its personally hard to leave running for any length of time before getting too strong. It may be me being too sensitive to the smell but I turned it on and off for 10-15 intervals even with a few windows open. If ozone works cleaning the scent, this generator is perfect. I haven't used it in a tripod or ladder stand in open air but see no reason why it wouldn't work well. During multiple hunts the deer neither heard the generator fan noise or acted skittish when passing down wind at 20yrds. I really like the size and operation of it overall and see many uses. Time will tell if it holds up though. I'm actually curious how others are running a Ozonics while sitting in a enclosed blind if the output is much stronger having zero experience with them. Last edited by Notaguide; 10-14-2018 at 12:18 AM. Actually hung the unit on a hook by the window but it does throw scent 360 deg as mentioned. I'm still experimenting but still see the benefits of the unit for clothes, closets, tree stand, and minimal blind uses compared to the Ozonics. It was $200 to my door so not a huge investment. If you use a Ozone machine inside your blind your doing it wrong and it could be a health risk. It should go right above and outside your downwind window. I've had good luck using them right on top of my blind right in the middle as long as the wind isn't too strong. I have not had good luck when using from a open stand like a tree stand or ladder stand. With my blind I can crack the side window ( down wind ) and set it on the shelf and its pulling air from inside but blowing out . That seems to be the best method thus far . With no smell I also use it on my hunting gear. I have a large plastic tote that I cut a few holes in and drop the unit in and let it run . So I am getting it figured out . I feel its made a difference in my hunting thus far . Now with no wind moving not sure if it would maybe come back in the other window ?? will have to see . i can say that battery life is very good . Hanging it in a window with no wind was the only time it was a issue. Actually had a couple of days including last night that it was a problem and cycled it as mentioned. Much breeze at all, I haven't had a problem. The "radial" part is obviously the issue but can work around it with a little effort. When working around ozone chambers in a previous job, we were well of the health concerns and still am. Basically if you can smell it, it's too strong was the rule. Thanks to the recent cold front we can shut all windows and contain more of the scent without the use of a generator. Could you block off part of the “radial”? Tape, foil? Got mine in last night and charged it. On "turbo" does your's have a whistle/static noise? ...I just got my 400b in and I have zero paperwork on how to use the different modes. Anyone care to give me a rundown on how to cycle through the modes? Skip to the 6:00 mark for instructions. So a new update . My RV is a toyhauler with a 10 foot garage . So I hung up my hunting clothes in the back and open the the small side vent and we have a small fan as well So I set the fan up on the other side of the window . I let it run for about 30 minutes . amazing the clothes had zero smell . So then I took a tee shirt and sprayed it with some of the GF perfume.. Just a test mind you 30 mins later almost no smell 1 hour completely gone . Its really working in that sense . I have a small bow holder arm that I can rig up with a simple clamp from a ebay go pro kit that will allow me to put it at any window and angle move it in or out to where I need . I plan on trying one of these units. Thanks for all the advice. Not sure why it was a few min off on the 3rd test . I allow it to fully charge and then re start the test . i have to say my shop lost the oil smell for those days . bay doors open but still odd how it can effect such a large area . I had this item from a ebay mounting kit for a old go pro . The clamp works great , I can clamp this to just about anything and hang the unit off the lanyard . So more updates . Sat eving hunt was hot in the 82 range No wind to speak of . I had used the unit for my cloths after morning hunt , I hung it out the window when i got back in the blind I had the window on the redneck wide open to cool down some . had 5 does two fawns out in front at one point two does at 1-2 yards in front of me , I almost could not see them ( stand is on 5 foot riser) the wind started to pick up and was ALL wrong , I thought for sure I would get busted . Nothing they never had any idea I was there . Also while sitting idle in the blind I had an idea to help with the radial part if no wind to make sure the OZ did not get back into blind . I took a Gator Aid bottle and cut off about 1/3 it slides over the unit perfect. Then I made a slice on the bottom of the bottle that looks like a smile .. I lifted that section so now its directional and I can direct the flow if needed . That sounds like a good mod to the unit, force the ozone out at a specific point. I’m sold on the benefits of using Ozone, either in the stand or in a container to treat your clothes. For those running them in plastic containers, do the machines produce a residue?? I used to work on copy machines and most had a hiigh voltage system. There was a channel that contained & isolated a thin wire running high voltage to produce an opposite charge and therefore an attraction to toner particles. This system as I was told would produce ozone as a byproduct of the high voltage. During maintenance you could smell and see residue all over the channel containing the charge wire. 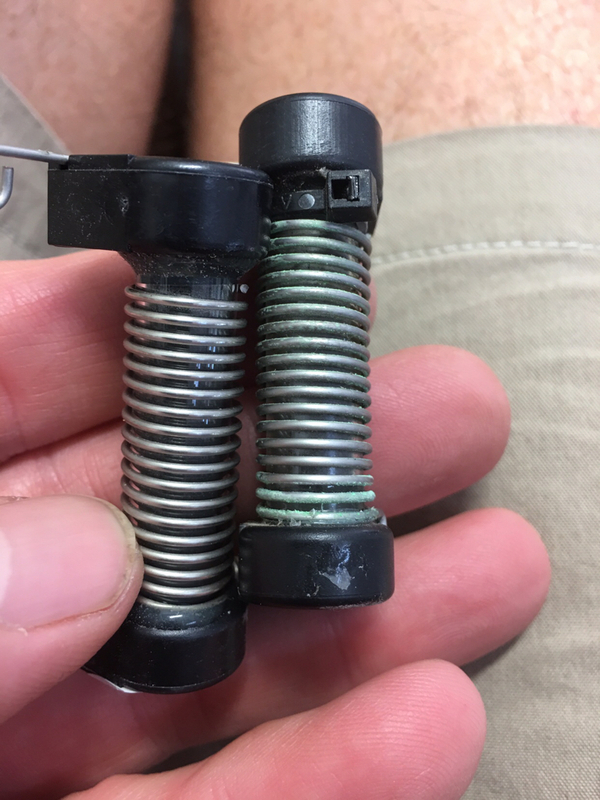 These are coils for an ozone generator, the one on the right is the old one, you can see a residue/oxide has formed on the coil, which made it ineffective and not producing ozone. This appears more like corrosion to me, and could probably easily be cleaned off, but I had new ones so I just replaced it. This unit sat unused for almost two years, when I put it up it was working perfectly. If you’re asking does it leave a residue on the clothes, no, I have seen no residue at all. So I found/ bought a cheap garment bag ( 12 dollars) It had two sections of plastic that folds up and down on top and bottom to make it more rectangle in shape. I can hang two sets of hunting cloths in side it gloves hats as well and I Put the OZ in the bottom where there was a small flap sliced a V shape hole in top and let it go .. IT works very well better than the tote . You have a link or pics of this garment bag? Is it something like the one Ozonics sells? The unit is pretty strong so recommend avoiding items with much elastic. Ruined a pair of nice Simms pants that had a elastic inner belt along with smaller items. So with season at its end I thought I would bring it back to the top . Used it in the ground blind this season. Works well.